Join me at Better Than Starbucks! I don’t talk much about my poetry writing on the blog, but I do post occasionally on Facebook about when I submit poems to magazines and contests and when I receive rejections. I don’t let those rejections get me down … not too much. I save the acceptances for the blog! I love to announce what magazines have accepted my work, and I’m doubly happy that my urban haiku are beginning to find homes. I’m not a traditional haiku writer. I’ve known this for a long time. Like a modern woman, my subjects are bit more familiar to urbanites. Hope you’ll check out the great poems at Better Than Starbucks! I’m in the November issue (2nd column, midway down). Thanks to Kevin McLaughlin for seeing merit in my little haiku. Over the last weekend while on vacation, I got the wonderful news that a very personal poem about my Vovó, who passed away two years ago. I knew that she was ill and didn’t have much time left, and I was furiously writing. I planned to read it at her funeral, but I was so emotionally wrecked, I was unable to do so. I did the next best thing — after seeking sage advice from a few writer friends — I let the poem rest with her. Fast forward two years, I tried to read Pergola at the poetry reading I participated in this year, but failed miserably at that as well. However, during that reading, I met the wonderful Gregory Luce, who suggested I send him a few poems. I was happy when he told me Pergola found a home at Bourgeon. Please feel free to check it out. Many of you may be aware that I’ve been on a mission of late to submit my poems to magazines and journals and to finally finish up a poetry manuscript that has been shut away for a very long time. Some of the poems submitted have been resubmitted to different magazines after their rejections, so I keep them constantly circulating. The one poem that has been accepted is a haiku, and it will be published in Wild Plum. The wonderfully talented poet Nadia Gerassimenko published some of my previously published and unpublished poems at her website, tepid autumn. Feel free to stop by and comment. Despite all of this project, I did miss 2 deadlines I had hoped to meet for other competitions, but sometimes the day job is tiring and the family needs me, so I have to let those things go. Ok, I know I’ve been lax in reporting my weekly writing goals, but I think that I’ve been a bit consumed by Writing Goal Week #14, in which I accepted the challenge of writing one poem per day based upon prompts posted at Poetic Asides. I now have 30 poem drafts to work from for the month of May. While I didn’t write each day, I did make up days I missed by sometimes writing between 2-4 poems in one day. This is a huge accomplishment for me. I did post these rough drafts as part of my tribute to National Poetry Month; I hope you enjoyed them. I will work on these 30 drafts to polish them for submission. If I happen to work on new poems that will be great as well. What goals have you set for yourself or achieved? Giveaway for Eleanor Bluestein’s Tea & Other Ayama Na Tales short story collection, here; Deadline is May 6, 2009, 11:59 PM EST. While I still have not written any poems along the Blossombones’ theme of Marked. I have been keeping up with the Poem-A-Day Challenge on Poetic Asides in my tribute to National Poetry Month. I’ve even posted the rough drafts on the blog for you to read, Poem #1, Poem #2, Poem #3, and Poem #4. So to continue this week, I will strive to keep on track with each new prompt from the Poem-A-Day Challenge on Poetic Asides. Feel like joining in, please do so. It’s fun to get those poetic muscles moving, even if you don’t write poetry normally. Think of it as a way to improve your blog writing and your critical thinking skills. The last writing goal was to write some newer poems for Marked issue of Blossombones or some new poems for any reason. Not feeling very inspired these days with all the bad economic news, the closure of newspapers across the country, and other personal events. However, the best month of the year is coming, and I feel the tide turning. The distractions continued this week, but I have a new motivator beginning in the middle of this week. I will be joining the Poem-A-Day Challenge on Poetic Asides to provide me with additional incentive to get some poetic verse written, especially since April is National Poetry Month. Check out the list of judges for the PAD Challenge, and you’ll notice a familiar name; I interviewed Mary Biddinger, here. I couldn’t get away with not mentioning National Poetry Month, which starts April 1. The American Academy of Poets has some great information on the festivities, including how to get kids interested in poetry and poetry readings. 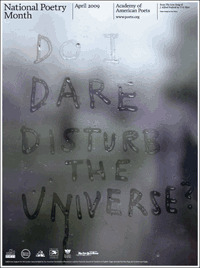 You can even download a copy of the poster image “Do I Dare Disturb the Universe,” which I think is a fantastic creation. Check out the list of events the academy has embarked upon since 1998. There is a list of events for 2009 on the main page as well, including Poem-In-Your-Pocket Day on April 30, 2009, the Free Verse Photo Project, and the National Poetry Map, where you can look up your state and get a list of events, journals, and other poetic tools near you. Check it out, become active this month! 1. There will be a swath of contemporary poetry book reviews this month, though I do have some fiction tour dates already scheduled for the month, so it won’t be all poetry. 2. I will provide you updates on my PAD Challenge progress and other poetry events happening in the Washington, D.C./Maryland/Virginia area. 3. The poet interviews should continue this month as well in conjunction with 32 Poems. I urge you to subscribe to the magazine if you have enjoyed the poetry posted with this project and the interviews. 4. There will be updates about the upcoming Conversations and Connections Writer’s Conference in Washington, D.C. on April 11 and of course, the recap. I interviewed Jehanne Dubrow recently, here. The last writing goal was to write some newer poems for Marked issue of Blossombones, but life interfered again. With changes at work and bad news on the money front as a result, I was a bit distracted this past week. I vow to be less distracted this week and buckle down to finish my goal of writing new poems for the Marked issue or just some new poems in general. The last writing goal was to continue creating poems for the Marked issue of Blossombones. I still have until April 30, 2009 to finish a bunch of poems for this issue, so this will probably be my goal for a couple of weeks. This week I finished the third and fourth poems I began a couple weeks ago. I plan on writing some newer poems for the Marked issue. Thanks for your support. I have two copies of Diana Raab‘s My Muse Undresses Me and one copy of Dear Anaïs: My Life in Poems for You. Deadline is March 18 at 5PM EST. One gently used ARC of Reading by Lightning by Joan Thomas; Deadline is March 20 at Midnight EST. The last writing goal was to continue work on the third poem I started or to create additional poems. I didn’t go back to the third poem this week, but I did wake up in the middle of the night and write down a couple of stanzas to a fourth poem. I’m aiming to submit a few poems to blossombones for their Marked issue. These two poems I’ve started, are just two of the ones I’m looking at submitting. I have until April 30, 2009. So, the goal for this week is to continue my efforts to create poems for the Marked issue. Thanks for all of your continued support. I appreciate it. The writing goal for last week was to continue work on the third poem I started, but it just didn’t happen this week. I really had a tough time juggling work, running a giveaway, posting interviews, and the numerous other projects I had going on. Suffice to say, this was a disappointing week for me. However, I did take Arlene Ang’s advice and submit some poems to two zines, Envoi and Identity Theory. I strive to do better this week. I hope to work on the third poem or create some new poems this week. Wish me luck! The Writing Goal Update for this week is much better than most. I worked on three poems last week. The first poem is nearly done and I think the second one I uncovered last week is more complete than it has been since I put it away many months ago. I started a third poem this week with some inspiration from a magazine theme, so if I can finish this poem and some others, I may just submit them to the magazine for publication. Softdrink at Fizzy Thoughts last week kindly informed me that those men that paint the lines on the roads use striping machines, so that popped into one of the poems. I’ve also had that good friend of mine, Anna from Diary of an Eccentric, take a first look at these drafts and make some suggestions or comments. Iliana of Bookgirl’s Nightstand also asked last week if I had any plans for these poems, and indeed I do. I am working on poems for a full-length manuscript, which I hope to complete by the end of this year. I’m not sure that all the poems I create this year will end up in the manuscript, but the more poems I work on and complete, the better pile I will have to pick from. If anyone has any other questions, please feel to ask. Continue work on my third poem and hopefully start other poems this week as well. The Writing Goal Update for this week is better than last week. I not only made progress on the one poem I’ve been working on, but I worked on a second poem I had set aside some time ago. I’m not completely sure they are done, but at least I’ve made progress. By the way, anyone know what those highway workers are called? Those ones that paint the lines on highways and roads? Or the name of the machines used to paint the lines on roads? If I can find the answers to the above questions, I may be able to finish one poem. However, if I don’t I need to start working on some other projects for a while.